This topic contains 72 replies, has 1 voice, and was last updated by Mike 2 weeks, 6 days ago. This topic was modified 4 years, 8 months ago by Mike. This topic was modified 3 years, 1 month ago by Mike. Forum rules have been updated around posting of private sales. 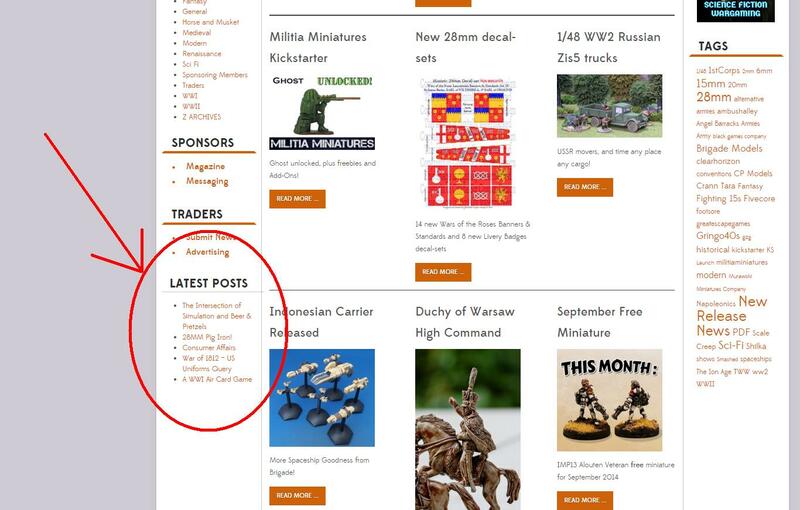 Removed the drop down from the black tool bar as it was showing posts from the sponsors and traders forums to all members. Profile button at top right should still be visible. New fancy pants toolbar added, with smilies and all sorts of cool. Captcha field added for new users, should help cut down on on spammer bot types. Added a hit counter to Wargaming News, you can now see how many times a news article has been viewed. The repair tools that should fix the freshness are actually making it worse! I will stop trying to fix it and just let peoples posts correct it. Hopefully after 24 hours it should be back to normal and reading right. added more social sharing buttons to news articles. I have discovered a pending pile of topics that have for some reason never been published, some of the topic authors have told me of this issues via e-mail. Now that I have found where they are I am looking into why they were not published. The Trading Post has for the time being been moved to the Standard Area of the forums. Private Messaging available to Sponsoring and Trader Members. I am seeing a lot of posts and e-mails about changing TWW. I have no problem with people making suggestions on how to better TWW. Please note that I will not be answering any of those questions for a short while. TWW is still not finished and I want it to be done before I start changing it. So, when I have done the new features I will go through the posts on the Suggestions and Recommendations thread and try to address them one by one. The Suggestions and Recommendations thread is in the Sponsors section of the forum. This means that only Sponsoring and Trader members can access it and post there. It is there because TWW is my creation and running it is one of my jobs. It is however not free to run, the money from the Sponsors and Traders goes into keeping the site running and paying me a wage to actually maintain it. Given that the Sponsors and Traders generate my income source it is them to who I will look to for Suggestions and Recommendations. They are after all, a bit like shareholders, a bit. Does this mean the people that use the site for free don’t have a voice? But please understand, as noted above that I can’t do what everyone wants, as people do not all want the same things. If I did everything that people asked, me and the site would implode. I can’t listen to you all. But I can listen to some of you. I think it fair that those who have invested their own money into TWW are the people that I listen to. So hopefully that makes sense and seems fair. I will look at changes put forward in the correct part of the site and they will be very carefully and thoroughly considered. See you once the new features are all done! This reply was modified 4 years, 7 months ago by Mike. Event Calendar added to main menu! I have increased the number of topics shown on the latest posts part of the front page from 5 to 10. There has been an issue with trying to reset user passwords. It returned the error message saying “Password reset is not allowed for this user”. That has been fixed now. Or at least it now works when I try it with my test account and the Angel Barracks account. Sorry for the problems this has caused. Just want to re-iterate that TWW is about gaming, so please keep topics about gaming, also, our adverts will be about gaming too. Each user may create their own poll. There is a Poll button on the message box toolbar and prompts that allow you to make the poll. It will list which people have voted in the poll, but not how they voted. Wargames Directory now launched, link is in the main menu. TWW will put some topics into a pending status if it thinks they are spam. It decides if they are spam based on the number of URLs a topic has. I have increased the number of permitted URLs to 10. Any topic with 10 URLs or less will no longer be caught in the spam filter. We now have an Air and Sea forum with child forums of Naval and Air, for those that wanted such things. I hope to see them used! I am trying out some forum ideas for companies to have their own forum as part of TWW. They are random test posts floating around that may appear odd. Forum rules have been updated. Several 15mm sci-fi manufacturers have requested a 15mm sci-fi forum. So I have made it. Over the next day or so I will port across the relevant topics. 6mm sci-fi forum now added. Next week I shall be away in a sunny country on holiday. I am assured that the holiday destination has wifi. So… I should be able to access the site and my e-mails and get news posted as normal. However in the unlikely event that I can’t, then please accept my apologies. Assuming it does have wifi, I shall check in, in the morning and last thing at night and get news posted and so on. If however you have any news stories that will need posting next week and they are ready now, please send them with the date you want them publishing and I can schedule them now. Due to the extra functionality that TWW offers compared to before, it will be moving server to one more suited to its needs. This will, all being well, be sometime later tonight (UK time). Please be aware there may be a slight down time during the move. Your patience and love is appreciated! I shall be away for a few days next week. I will still be checking my e-mails for posts and news submissions and so on, but not as regularly as normal. So please take that into account if I don’t respond as quickly as I normally would. If you have news that needs posting when I am away, feel free to send it now and I will schedule it in readiness. I have now added a Club database to go with the Events Calender and the Manufacturers Directory, it is in the main menu, under… clubs! Sorry for any tardiness today with posting news and catching spam, not very well. I have added an extra field to the registration process to see if that helps keep the spam bots out. Now sharing news to Pinterest. This reply was modified 3 years, 2 months ago by Mike. Unread topic feature now added. Added a social share function to topics so you can share topics you like to social media. 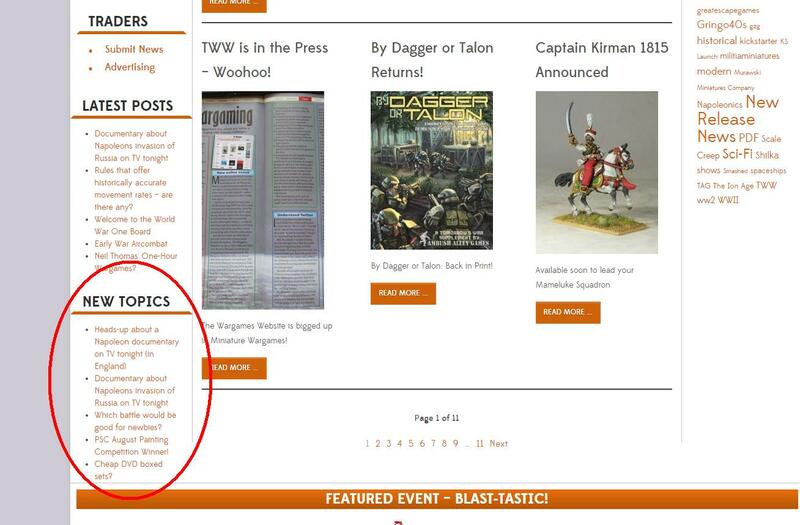 The forum ‘Announcements from TWW.’ is closed to new topics and replies.